There’s something about hitting the course on a clear sunny day that sets the soul at ease. Sadly, as enjoyable as playing a round may be, golf is an activity that favors those with quite a bit of disposable income. Due to this rather excessive barrier to entry, it only makes sense that there’s a large community of gamers that have been clamoring for the next chance to tee off on PlayStation 4. The Golf Club 2 looks to follow up on the surprisingly solid first offering in the series, while also attempting to bury 2015’s Rory McIlroy PGA Tour, even deeper than the hole it managed to dig itself. After living through an entire year devoid of full golf games (sorry, mini-golf doesn’t count) it was a welcome change of pace to see The Golf Club 2 make a return after several observing from the gallery. Everything that made the original iteration a shocking success is still very much present and accounted for, while also attempting to address several issues that were gigantic sticking points the first time around. The freshman outing was criticized rather heavily for its lack of a career mode. Societies are supposedly the answer to this unanimous critique, while also acting as the connective tissue that holds both the career mode and online multiplayer together. Players have the ability to custom design their own seasons, which in-turn unlocks higher complexity events as the player’s career progresses. In another interesting twist, much like in the real world of country club golf, in order to get access to the premier courses and events, players have to pony up in-game scratch. This currency is primarily accrued through successful completion of tournaments. Up to four players can simultaneously play through a tournament online, or you can simply play by your lonesome. 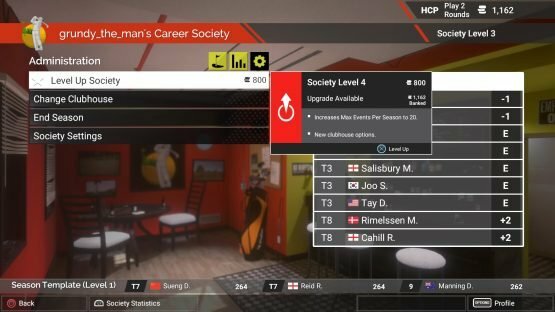 Though it’s very obvious that genuine thought has been put into The Golf Club 2’s implementation of a career mode, it seems like the development team may have missed the fairway a bit. When most players think of a “career” in a sports title what comes to mind is taking an unknown athlete from poverty to prosperity. This is especially the case in a non-team sport like golf. Something as simple as allowing players to acquire and equip clubs with better stats and characteristics would’ve been a step in the right direction. Unfortunately, even something that simple is nowhere to be found. To be fair, there’s basic functionality for players to spend their in-game currency on personalizing both their clubs and wardrobe. The problem is that these changes appear to only be in the form of cosmetic customizations. There’s nothing that would indicate that these purchasable items do anything to enhance performance, unless you are striving to be the snazziest golfer on the red carpet. Societies are very much in the same boat as player customizations. It only allows the player to upgrade their clubhouse in order to get access to better quality events. Outside of the visual aesthetics of each clubhouse, which is primarily used as a lobby between matches, there’s no significant progression of any sort. Ultimately the result is a disappointingly lackluster single player experience that still feels like it lacks the persistence and goal-oriented nature of other historically successful sporting campaigns. The parade of, “meh,” continued on the actual course itself. While the minute-to-minute simulation aspects of the sport are present and accounted for, the same cannot be said for the actual presentation. Many of the textures that comprise a course’s design just don’t seem to be realistic at all. Yes, there are some courses that do a decent job of hiding the muddled visual presentation. However, all it takes is one look at a water hazard to know that graphical fidelity wasn’t a high priority on the development team’s list of enhancements. And don’t even get me started on the sand traps that don’t actually show the trail of a ball that has rolled across it. Mercifully, not everything is a downer this season. The extremely well-realized course designer was the key aspect that helped set The Golf Club apart from the crowd back in 2014. Three years later, it’s back and better than ever. Virtually anything that a mind would be able to conjure for a course is essentially possible, all thanks to countless new additions to the design toolbox. Even better yet, any courses that were created in the original installment will load in The Golf Club 2 for either porting over or enhancing. This means that there is a massive library over 100,000 courses, playable across all modes. Without question, this is the strongest feature of the game. In an era where PGA Tour Golf releases were launching with a mere handful of courses, this kind of variety is a godsend. One aspect of the campaign that I personally enjoyed was the ability to define my own season. After unlocking several tiers in the clubhouse structure I was essentially able to come up with a moderately lengthy series of events, using only courses that best suited my play style. Sure, it might be considered slightly cheap to only cater to my personal strengths, but why else would they let players design their own narrative? I can’t wait to pair up with a couple of my golf addict siblings and make our way through the playlist. I predict much obscenity in our future. When taking a step back and looking at the big picture, The Golf Club 2 feels like a solid follow-up to an already promising new franchise. Unfortunately, though it attempts to correct some of the series’ deficiencies, it still fails to deliver a cohesive single player campaign. The lack of any significant progression is a blatant blind spot that will to continue to haunt the series. Thankfully the action on the course itself is authentic enough to take players from the peaks of birdie ecstasy to the lows of triple bogey tap-ins. If a golf game can make me embrace profanity this much, it has to be authentic. This may not be a hole-in-one, but sometimes a solid par can be enough to win a tournament. Review code for The Golf Club 2 provided by the publisher. Reviewed on PS4 Pro. For more information on scoring, please read our Review Policy here.